Audi drive select allows you to use different set-ups on your vehicle. Using the three modes COMFORT, AUTO and DYNAMIC, you can change the set-up at the press of a button for a more comfortoriented or dynamic drive. On vehicles with MMI*, you also have the INDIVIDUAL* mode, which allows you to adapt the vehicle set-up individually to your personal driving style. For example, you might choose to combine a more dynamic engine set-up with a lighter steering response. The possible vehicle set-up in each mode depends on which equipment is installed on your vehicle. The engine and the servotronic power steering are basic parts of your vehicle which are always included in the set-up. In addition, you can change the characteristics of the automatic gearbox*, dynamic steering* and suspension control*. The response of the engine and automatic gearbox* to accelerator pedal movements will be more spontaneous or balanced, depending on which mode you select. The servotronic power steering will also respond to different drive set-ups. The dynamic steering* alters the steering ratio depending on the road speed to optimise the amount of steering effort required by the driver at any given time. This enables the sensitivity of the steering to be reduced at higher speeds in order to improve the handling of the vehicle. The steering is more direct at lower speeds to minimise the amount of steering effort required by the driver, e.g. when manoevring in tight spaces. The dynamic steering* also provides a more agile steering response at low and medium speeds. You can adjust the basic characteristics of the steering in the Audi drive select menu. The suspension control* uses sensors to collect information on steering movements, braking and acceleration input by the driver, road surface quality, road speed and vehicle loading. Using this information, the suspension can be adapted almost instantaneously to changing driving conditions. With Audi drive select, the driver can choose between dynamic and comfort-oriented suspension set-ups (DYNAMIC and COMFORT modes), or opt for a more balanced set-up (AUTO mode). The following table provides an overview of the characteristics in each driving mode. If your vehicle is equipped with dynamic steering*, the servotronic power steering settings are adjusted in the Dynamic steering* menu. • You can select the sport program for gear changes on vehicles with an automatic gearbox* by activating the DYNAMIC mode. There is no S position on the selector lever. • You may hear a noise on vehicles with dynamic steering* when you start or stop the engine. This is no cause for concern. 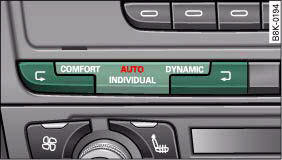 You can choose between COMFORT, AUTO, DYNAMIC and INDIVIDUAL*. The control is next to the selector gate ⇒ fig. 174 on vehicles with sound system, or in the centre console ⇒ fig. 175 on vehicles with MMI*. – Press the left or right arrow button until the desired mode lights up in red. You can change the driving mode while the vehicle is stationary or moving. If traffic conditions permit, take your foot off the accelerator briefly after you change the mode so that the new mode is also activated for the engine. 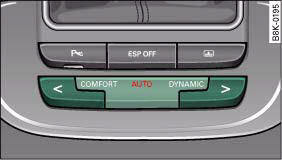 The COMFORT mode alters the vehicle set-up for a more comfortable ride. The response of the engine and automatic gearbox* to accelerator pedal movements is balanced. The steering is light and indirect* and the suspension control* is set to soft. This setting is suitable for driving long distances on motorways for example. The overall impression in AUTO mode is of a comfortable but dynamic ride. This setting is suitable for everyday use. DYNAMIC gives the vehicle a tighter set-up. The engine reacts spontaneously to accelerator pedal movements and the steering is dynamic and direct*. The suspension control* is stiffer and the automatic gearbox* changes gear at higher engine speeds. This setting is ideal for performance driving. You can configure this mode on the MMI according to your personal preferences. Always keep an eye on the traffic when using the Audi drive select controls - Risk of accident! If you remove the ignition key, the AUTO mode will be selected automatically the next time you switch on the ignition. You can configure your own personal vehicle set-up on the MMI*. – Select: Function selector button CAR > Audi drive select individual. To drive with the new vehicle set-up, remember to press the INDIVIDUAL* button ⇒ page 160. The system settings available on the MMI* depend on which equipment is installed on your vehicle. Your settings in INDIVIDUAL* mode are stored automatically and assigned to the remote control key currently in use.